February might not be my favorite month weather-wise, but it does bring a holiday that I do look forward to! No, it's not Valentine's Day... it's Galentine's Day! In the words of character Leslie Knope from the TV show Parks and Rec, "Oh it's only the best day of the year. Every February 13th, my lady friends and I leave our husbands and our boyfriends at home, and we just come and kick it, breakfast style." The airing of this episode a few years back is when Galentine's Day I think first became a mainstream thing. Anyways, who doesn't love a day to dress up in red and pink, eat sweet treats, and celebrate the special bond of friendship between girlfriends? Sign me up please!! I've had a few fun Galentine's Day celebrations over the last few years, but the best part is they were all very low-key. One year my Big in my sorority and I had a movie night, another year one of my best friends from college and I got all dressed up and went out for a fancy dinner "date" in Uptown Charlotte, and last year a few girlfriends and I went out for a Galentine's brunch- which would have been a very Leslie Knope approved activity! This year, Galentine's seemed like the perfect time to finally host a get-together at my apartment. 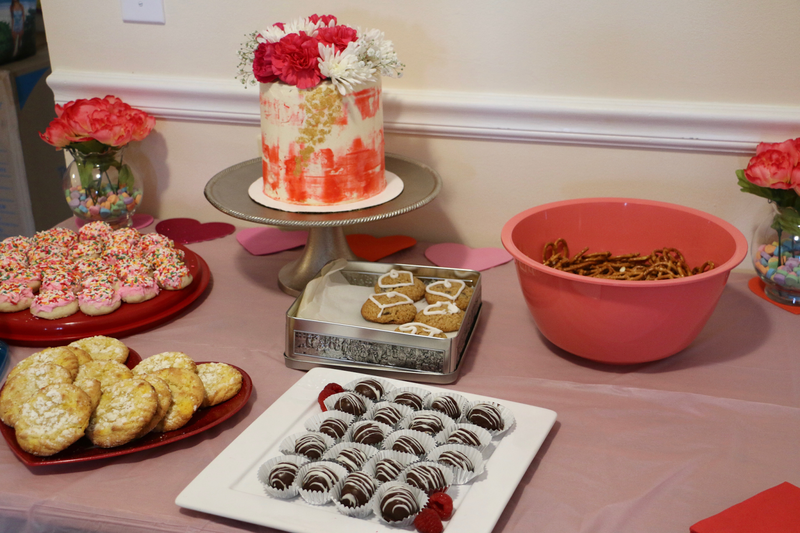 I love entertaining and have been wanting to have a party for awhile since moving to Vermont, and what better time than a girlfriends' get-together for Galentine's?! I was especially excited to celebrate this year since it took me such a long time to meet and make some girlfriends here in Vermont (which you know if you've been following my post-move update posts!). Anyways, I'll be focusing on how I planned the party in today's blog post, in hopes that it might give you inspiration if you'd like to do something similar with your girlfriends for Galentine's Day! Vermont's weather has been so unpredictable this winter, so I planned the party a couple week's before February 13th/14th, so that it could be rescheduled closer to then if needed for weather. Luckily, the weather ended up being great this weekend so no cancellations were needed. When I plan a party, I like there to be two themes. One theme for the occasion, and one for the food. (The rest of it doesn't need to be over-planned- let people have fun and mingle and enjoy what a get together should be. 😊) Obviously the occasion theme for this party was Galentine's, and spending time with girlfriends. Most of the girls that I was inviting didn't know each other, as I don't have one specific friend group here in Vermont. So I was really excited to introduce the wonderful ladies I have finally met to each other. I decided the food theme would be a cookie swap. Each girl could bring a dozen cookies, so that there would be plenty to eat at the party, and also plenty to swap with each other and take home. Easy peasy right? 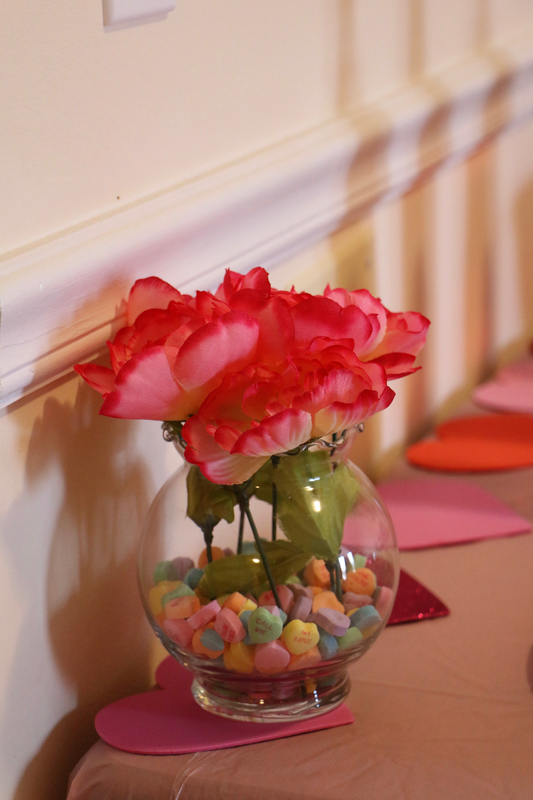 I purchased a few different pink beverages at Trader Joe's (both alcoholic and non-alcoholic), and set up some easy Valentine's decor on my dining table. I purchased the table cloth, plates and cutlery at my local Dollar Tree, and the fake floral centerpieces pictured below I made from this Pinterest tutorial! Everything for those was purchased at Dollar Tree as well. Host a fancy tea party, or go out for a high tea if a local hotel offers that! Here's to the love of friendship, and celebrating our best girls! Have you celebrated Galentine's Day before? Are you planning anything fun for this year? You might have seen a little peek at the outfit that I wore for my Galentine's party on my Instagram stories... I'll be doing a full blog post on the outfit coming soon! I am a long time email subscriber and am now finally making my first comment on your blog. It looks like you and your gal friends had a lot of fun! I am so looking forward to your Galentine's party outfit post. Finding my own style is a work in progress and your outfit pictures give me inspiration. You go, girl! These are such cute ideas! I love celebrating Galentine's Day. Such fun ideas! 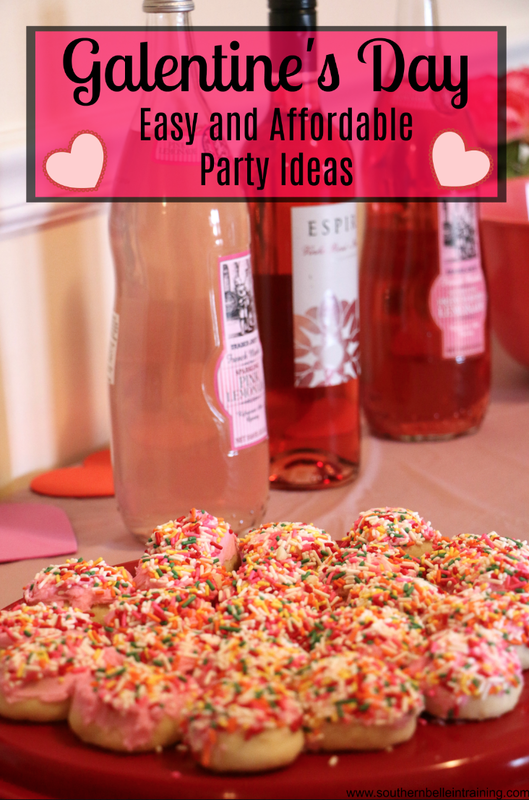 Galentine's is such a cute idea - love all of the fun pops of pink! I've never celebrated galentine's before! but after watching parks and rec and seeing everyone's cute set ups I really want to! It's such a fun way to celebrate female friendships! awwwwwhhh this is seriously sooo cute! i might have to do this one day :) thanks for the tips! All of your decorations are so cute, it looks like it was a great party! My favorite way to spend galentines day is with a nice brunch but the idea of a cookie swap is seriously too adorable! Such cute ideas. Dollar Tree definitely is my jam. What a cute idea! I would love to do something like this! 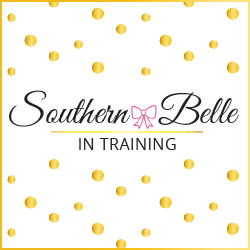 I love all of these ideas and getting together with girlfriends! These are all great ideas! I haven't had a proper slumber party in ages! I think I want to do it soon! That cake is stunning! I'm going to brunch the Sunday before Valentine's Day with a group of girls and having a girls night with another group. I can't wait for both events, especially considering i won't see my boyfriend for Valentine's Day. That party was so fun! I bought that lemonade you had because I liked it so much! All those treats look amazing! Your Galentines ideas are great, I like the idea of having a theme for the food too. Ahh I love a good Galentine's Party! I wanted to throw one so badly this year, but ended up doing a makeup party for a lipsense distributor this weekend, so we had wine and cheese and I'll count that as a win. I love how you celebrated and decorated on a budget. Dollar Trees are the best! A cookie swap for Galentine's Day is such a good idea, I have never thought of it before!! Those cookies look delicious!